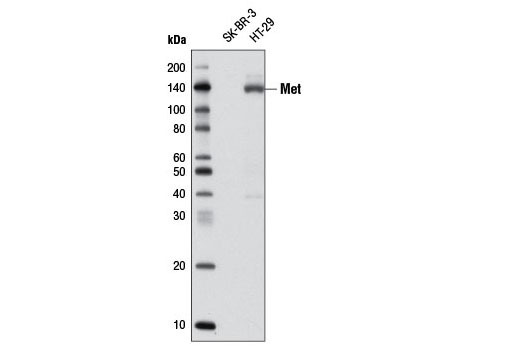 Western blot analysis of extracts from SK-BR-3 (Met-) and HT-29 (Met+) cells using Met (D1C2) XP® Rabbit mAb (Biotinylated). Met (D1C2) XP® Rabbit mAb (Biotinylated) recognizes endogenous levels of total Met protein. Monoclonal antibody is produced by immunizing animals with a synthetic peptide corresponding to residues near the carboxy terminus of human Met protein. This Cell Signaling Technology antibody is conjugated to biotin under optimal conditions. The biotinylated antibody is expected to exhibit the same species cross-reactivity as the unconjugated Met (D1C2) XP® Rabbit mAb #8198. Met, a high affinity tyrosine kinase receptor for hepatocyte growth factor (HGF, also known as scatter factor) is a disulfide-linked heterodimer made of 45 kDa α- and 145 kDa β-subunits (1,2). The α-subunit and the amino-terminal region of the β-subunit form the extracellular domain. The remainder of the β-chain spans the plasma membrane and contains a cytoplasmic region with tyrosine kinase activity. Interaction of Met with HGF results in autophosphorylation at multiple tyrosines, which recruit several downstream signaling components, including Gab1, c-Cbl, and PI3 kinase (3). These fundamental events are important for all of the biological functions involving Met kinase activity. The addition of a phosphate at cytoplasmic Tyr1003 is essential for Met protein ubiquitination and degradation (4). Phosphorylation at Tyr1234/1235 in the Met kinase domain is critical for kinase activation. Phosphorylation at Tyr1349 in the Met cytoplasmic domain provides a direct binding site for Gab1 (5). Research studies have shown that altered Met levels and/or tyrosine kinase activities are found in several types of tumors, including renal, colon, and breast. Thus, investigators have concluded that Met is an attractive potential cancer therapeutic and diagnostic target (6,7). Cooper, C.S. et al. (1984) Nature 311, 29-33. Bottaro, D.P. et al. (1991) Science 251, 802-4. Bardelli, A. et al. (1997) Oncogene 15, 3103-11. Taher, T.E. et al. (2002) J Immunol 169, 3793-800. Schaeper, U. et al. (2000) J Cell Biol 149, 1419-32. Eder, J.P. et al. (2009) Clin Cancer Res 15, 2207-14. Sattler, M. and Salgia, R. (2009) Update Cancer Ther 3, 109-118.